100ml gouestroop,150ml kakaopoeier,1blik kondensmelk,5ml vanilla. Verhit stroop effe,voeg kakao by en meng goed,voeg kondensmelk en vanilla by. 250ml room,30ml stroop,65ml strooisuiker,5ml mielieblom,koue water. Verhit als behalwe mielieblom en water oor lae hitte tot suiker opgelos is. Laat prut vir +-15min tot karamel kleur. Meng mielieblom met bietjie water tot gladde pasta vorm. Voeg by sous en laat verder prut tot sous effe verdik. Sieve the icing sugar into a bowl and mix in the water a little at a time. Make it thick enough to coat the back of a spoon but thin enough to flow easily. Use the icing at once because it sets quickly. Chocolate glace – Sieve 3 level teaspoons of cocoa with your icing sugar. Add a few drops of vanilla. Sif meel en sout saam en voeg gis by. Vryf botter in meel tot dit soos broodkrummels lyk. Meng die eier en melk en voeg by die meelmengsel. Meng tot ‘n deeg en knie vir 10 minute tot deeg glad en elasties is. Laat die deeg vir 30 minute rus. Knie deeg af, maak plat en vorm doughnuts (my man ht vir my ‘n doughnut cutter gemaak wat BAIE lekker werk!). Laat die doughnuts rys vir 20 minute. Bak in diep olie tot goudbruin aan albei kante. Dreineer op papierhanddoek en rol in strooisuiker. Sit droe bestandele saam – Klits eiers goed, voeg olie, lemoensap en skil by. Voeg alles bymekaar en meng goed. Drup lepels vol in pot met warm olie en bak tot ligbruin en gaar. Meng al die bestandele. Gooi in beker. Spray machine. Gooi deeg in en bak 6 min tot bruin. Meng meel, suiker en bakpoeier in ‘n mengbak. Klop eiers en water, voeg by meelmengsel en meng goed. Roer rosyne by. Verhit die olie tot warm en skep elke keer ‘n eetlepel van die beslag in die warm olie. Braai bolletjies alkant tot goudbruin. Moenie meer as 4 bolletjies gelyk braai nie. Skep met ‘n gaatjieslepel in uit, dreineer oortollige olie en rol in kaneelsuiker. Bedien. Meng meel, bakpoeier, kaneel, sout en nutmeg. Gebruik ander bakkie en meng melk en gesmelte botter. Gooi nou die melk mengel by die suiker en room mengsel en roer goed met lepel. Voeg nou die meel mengsel by en roer alles goed. Maak mengbak toe met clingwrap en plaas in yskas vir 2 ure. Strooi oppervlakte effens met meel. Rub the butter into the flour and mix in salt, sugar, spices and mixed peel, if using. Add the yeast and mix. Beat the egg and warm water together and add to the dough. Mix to form a soft dough then knead for 5-10 minutes until smooth and elastic. Divide into 24 pieces and roll into balls. Place on a lightly floured surface, cover and allow to rise until doubled in size. Mix the flour, oil and water together and place in a piping bag. Pipe crosses onto the buns. 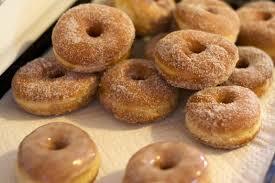 Heat a large pot of oil to 180C and fry the doughnuts, in batches until golden and puffed. Remove from oil and immediately dust in castor sugar. Rub the butter into the Golden Cloud Scone Mix until mixture resembles breadcrumbs. Beat the egg and milk together and cut into the dry mixture with a palette knife until mixed through. Place dough onto a lightly floured surface and lightly press out into a 15 mm thickness. Cut into shapes using a cookie cutter. 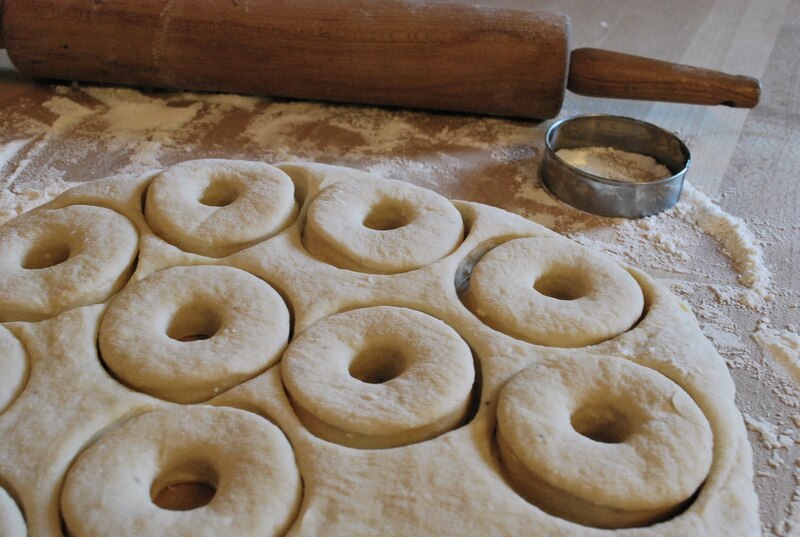 Cut a hole in the centre of each shape to form the doughnuts. 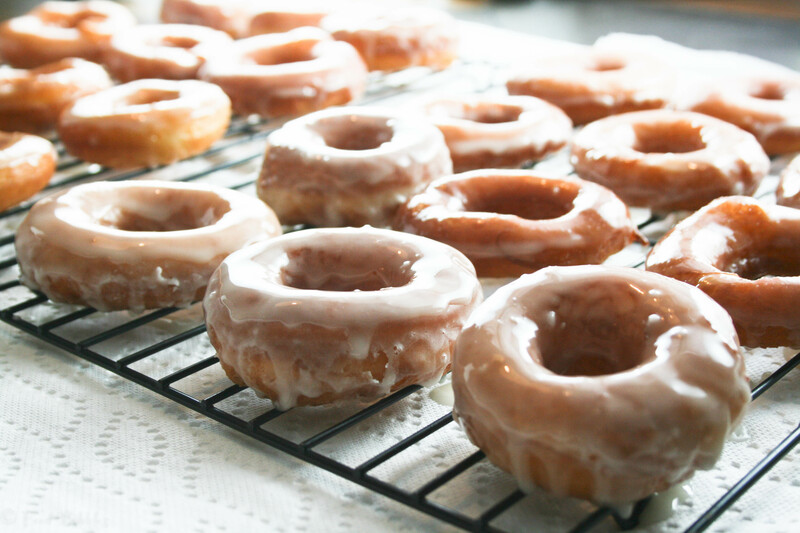 Preheat the oil in a large heavy-based saucepan and add the doughnuts in batches. Fry until cookies are golden in colour. Remove from oil with a slotted spoon and place on paper towel to drain. Allow to cool slightly before rolling in the castor sugar. Wait a while before cracking these open as the residual heat will continue to cook any uncooked batter in the middle. Preheat oven to 180C. Spray donut pan with non-stick cooking spray. In a medium bowl, combine flours, sugar substitute, and baking powder. In a small bowl, mix together the buttermilk, eggs, honey, butter, and vanilla. Add the wet ingredients to the dry ingredients and stir until well-combined. Stir in mashed strawberries. Spoon batter into a pastry bag or a ziplock bag with the corner snipped. 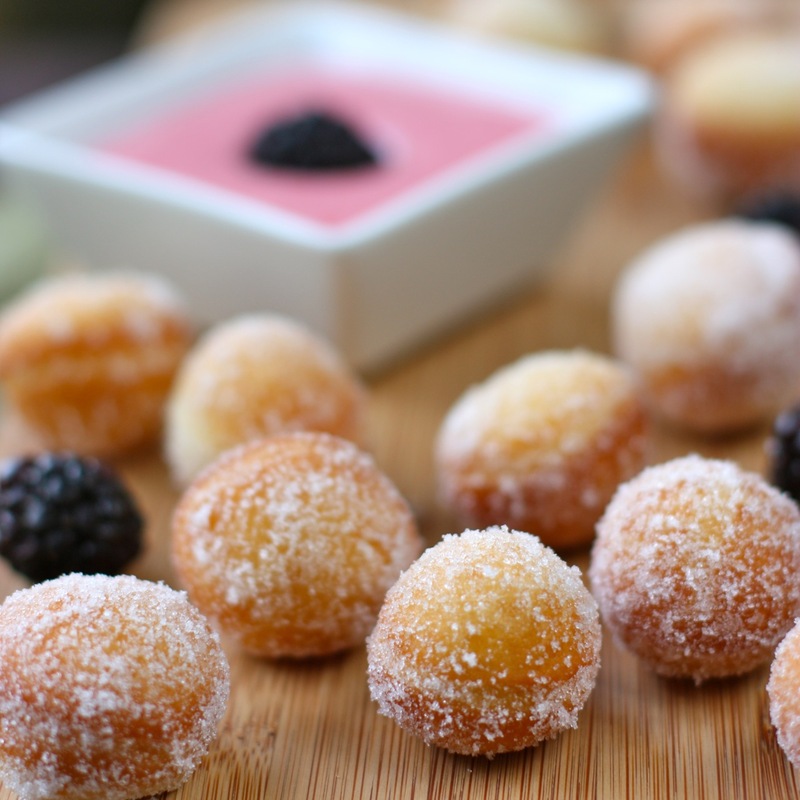 Pipe batter into a donut pan or mini muffin pan. Fill about 2/3 full. 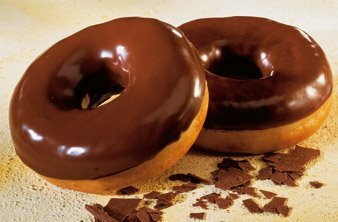 Bake for 5-7 minutes or until donuts start to turn light golden brown. Allow to cool for a couple of minutes in the pan before removing to a wire rack to cool completely. While the donuts are cooling, prepare the glaze. In a small bowl, beat the strawberries with a hand mixer until well mashed. Add the confectioner’s sugar and lime juice. Beat until smooth. 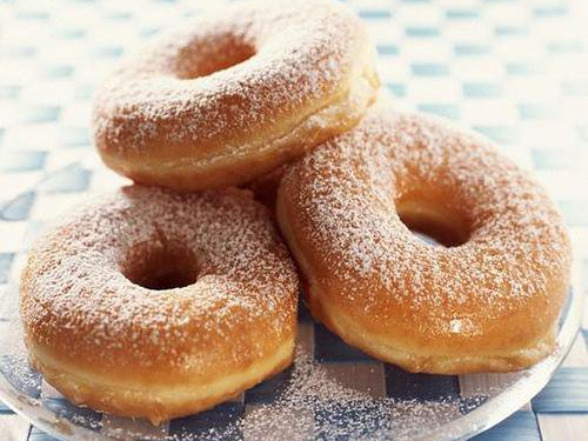 Dip cooled donuts in glaze and allow to harden. 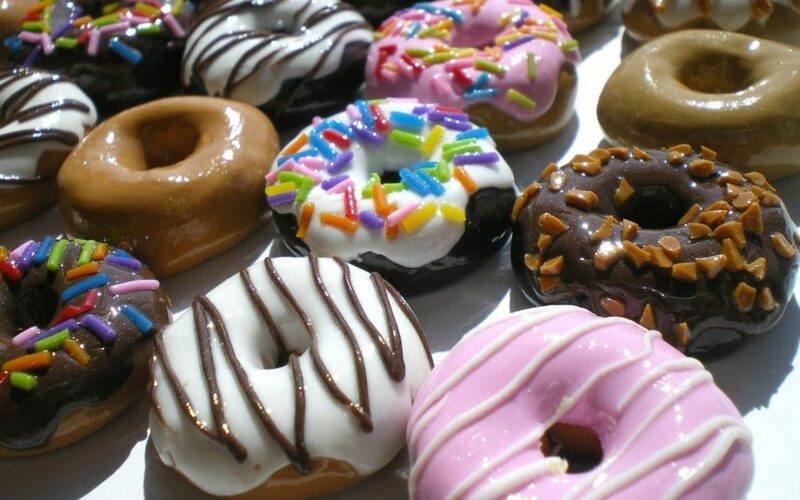 Store left-over glazed donuts in the refrigerator, if there are any left!